The Rapid Tester® is a semiautomatic instrument for determining the flash point temperature / combustibility of flammable liquids. Closed cup test temperatures from ambient to 572°F (300°C) are automatically controlled by the set-a-temp adjustable digitally preset target temperature circuitry. Integral digital LCD display, NIST traceable thermometer, disposable fuel tank and electronic timer are standard. Quality Assurance - Verify the formulation of liquid products with flammable ingredients. Fuel Dilution - Determine the relative percentage of fuel in engine crank case oil to forecast the need for engine rebuilding. Dimensions: 15.0 x 3.4 x 6.3"
Achieve the high level of digital performance offered only by the Rapid Tester®. The high contrast LCD display has 1/2" characters for ease of reading and is switch selectable between degrees Fahrenheit and Centigrade. A thermometer traceable to the National Institute of Standards & Technology is also included. Unique set-a-temp circuitry permits simple adjustment and precise automatic regulation of test temperatures. Depress the Preset switch while turning the Temperature Control knob until the target temperature is displayed. Release the switch and set-a-temp takes over! Test cup temperature is automatically shown on the digital LCD display. Test time is only one minute with a 2 ml sample for flash points below 212°F (100°C). You can run ten tests with the Rapid Tester® in the time that it takes to perform just one by other methods. The 2 ml/4 ml sample is a fraction of the large sample required by other flash point methods. This reduces sampling and disposal problems while improving safety. The Rapid Tester® Closed Cup Model RT-01 has a testing range from -22° to 572°F (-30° to 300°C). Open Cup Model RT-02 tests for flash point levels from ambient to 212°F (100°C). With better than 99% comparability you can use the Rapid Tester® with confidence. Rapid Tester instrumentation is warranted against defects in materials and workmanship for one year from date of shipment and will be repaired or replaced at our option. This warranty is exclusive of shipping charges, consumable components or misuse. The liability of Gardco is limited to such repair or replacement. No warranty of fitness for a particular purpose or liability for consequential or other damages shall be implied. Note: This contains only a general description of the Rapid Flash Point Tester. While uses and performance capabilities are described, under no circumstances should the product be used except by qualified, trained personnel and not until the instructions, labels, or other literature accompanying it have been carefully read and understood and the precautions therein set forth followed. Only they contain the complete and detailed information concerning this product. Not intended for use in hazardous areas. The manufacturer reserves the right to alter design and/or specifications without notice. Integral digital LCD display, NIST traceable thermometer, disposable fuel tank (butane cylinder), electronic timer, valve assembly w/tubing, syringe, heat transfer compound, AC cord and directions. Ideal for use with Electronic Flash Point Testers. 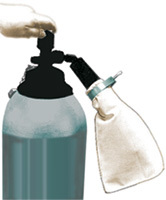 Redi-ice is a mechanical attachment that fits any standard carbon dioxide cylinder. Redi-ice provides dry ice in flaked or solid form. Redi-ice comes complete with adaptor nozzle, cone, collection bag, clamp and washer. Produces approximately 12 lbs. of dry ice from a 50 lb. CO2 cylinder. Also ideal for use with Refrigerant Charged Cooling Block.